INDUSTRY.co.id - Jakarta - The Indonesian Palm Oil Entrepreneurs Association (GAPKI) noted a decrease in Indonesian palm oil export performance including biodiesel and oleochemicals by two percent in the first quarter of 2018 compared to the same period of the previous year. GAPKI Executive Director Danang Girindrawardana said that, in the first quarter of 2017, Indonesia's palm oil exports reached 8.02 million tons, but in the same period 2018, it slumped to 7.84 million tons. Danang added that such obstacles are among others from the European Union which passed a European Parliament resolution accusing palm as the cause of deforestation, India raising import duties on vegetable oils. In addition, the United States is launching allegations of anti-dumping biodiesel and RRT tightening controls on imported vegetable oils. GAPKI noted that for crude palm oil and its derivatives (excluding Olechemical and Biodiesel) in the first quarter of 2018 decreased by three percent in the first quarter of 2018 compared to the same period last year or from 7.73 million tons in the first quarter of 2017 decreased to 7, 5 million tons in the same period of 2018. On the other hand, Indonesia's palm oil production performance in the first quarter of 2018 rose 24 percent compared to the same period in 2017 or from 8.4 million tons in the first quarter of 2017 to 10.41 million tons in the same period of 2018. Significantly increased production is due in the first quarter of 2017, which is still recovering from the drought experienced in 2015, but also the extent of crops that began to produce began to increase so that production can continue to increase despite many plantations that implement the rejuvenation of the garden. Indonesia's palm oil export performance in March 2018 also increased by approximately one percent. Throughout March, the export volume of Indonesia's palm oil (excluding biodiesel and oleochemicals) was only able to reach 2.4 million tons, or 33.86 thousand tons, compared to 2.37 million tons in February. The relatively stagnant export performance was influenced by the Indian government's policy to raise its oil import tax in March 2018 for CPO of 44 percent from only 30 percent and refined palm oil 54 percent from 40 percent. India's policy to raise import taxes on vegetable oils caused Indonesia's palm oil exports to India to drop 33.44 thousand tons, down about 8 percent in March 2018 compared to the previous month, or from 442.09 thousand tons in February down to 408.65 thousand tons in March. 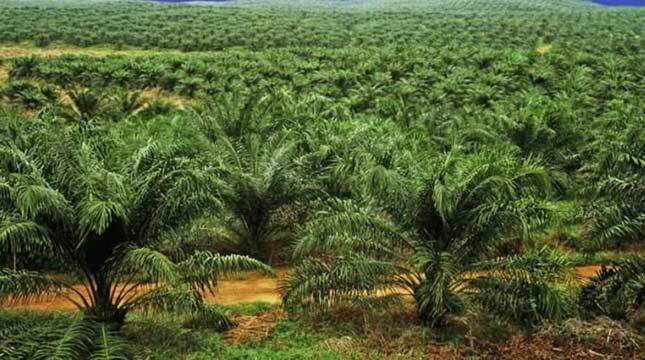 The decline in Indonesia's palm oil exports in March 2018 compared to the previous month also occurred to Bangladesh 59 percent, Middle East countries 30 percent and Pakistan 0.5 percent. On the other hand, some of the traditional market countries of Indonesia's export destinations such as the European Union, China and the United States in March 2018 recorded import increases of 38 percent, 16 percent and 11 percent respectively compared to February. New markets of African countries also recorded an increase in imports by 38 percent. From the production side, in March 2018, Indonesia's palm oil production recorded a nine percent increase or 3.35 million tons in February and rose to 3.65 million tons in March 2018. Increased production is due to long working days and supportive weather. With rising production and relatively stagnant exports, Indonesia's palm oil stocks posted an increase to 3.65 million tons in late March compared to February at 3.5 million tons. In terms of prices, throughout March 2018, global CPO prices moved in the range of 665-695 US dollars per metric ton with an average price of 676.2 US dollars per metric ton. March average price increased 13.1 US dollars compared to the average price in February which amounted to 663.1 per US dollar metric tons.